Australia’s post 2020 climate targets were approved in cabinet last night ahead of a Liberal and National Party room caucus meeting today. The post 2020 climate targets were announced at a press conference (See transcript and media release) today and amount to 26 to 28 per cent emissions reduction on 2005 levels by 2030. In comparison, the Climate Change Authority which has investigated both the science and comparative international action, called for a 40 to 60 per cent cut on 2000 levels by 2030. Other reputable organisations have also called for higher targets. The Australian Academy of Science called for emissions cuts of 30 to 40 per cent for the same period. 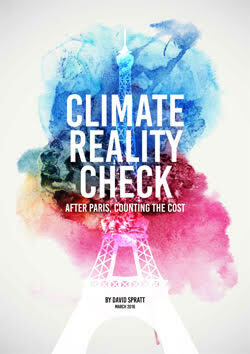 The independent Climate Institute urged a 45 per cent cut on 2005 levels by 2025. Climate Action Moreland submission to the Climate change Taskforce was that Australia should shift our 2020 target from 5 per cent on 2000 levels to 25 per cent reduction on 1990 levels. This then would place Australian climate action in accord with what the best scientific advice demands as our fair share. For 2025 we should reduce greenhouse gas emissions by 40 per cent reduction on 1990 levels. Norway has already committed to this target. For 2030 we should reduce greenhouse gas emissions by at least 50 per cent reduction on 1990 levels. Switzerland has already committed to this target. Australia is responsible for about 1.5 per cent of global emissions at 18.3 tonnes per capita, but our export coal accounts for another 3.3 per cent of global emissions. Export LNG would also increase global emissions. During the press conference Tony Abbott outlined that protecting the coal industry was more important than protecting the environment: “Our policy doesn’t depend upon the demise of coal. In fact, the only way to protect the coal industry is to go with the sorts of policies that we have. That’s why I think our policies are not only good for the environment but very good for jobs.” he said. In a recent public opinion poll 50 per cent of respondents wanted renewables favoured over coal and only 6 per cent favoured support for the coal industry over renewables. Foreign Minister Julie Bishop, to a question whether Australia is still committed to keeping temperature rises below two degrees? how Australia’s target fits in with that goal which we agreed to in Cancun in 2010, responded by evading and not answering the question. “The Paris meeting is about getting a global agreement where every country puts forward their targets in advance of the meeting and then there will be a discussion about the framework action that would be required in order to meet the two degree goal.” she replied. Environment Minister Greg Hunt outlined how the Government would achieve these targets without a carbon price. They will continue using the Emissions Reduction Fund with the addition of the safeguards mechanism. Other measures include developing vehicle efficiency standards, implementing ozone and fluoro carbon measures as part of the next round of the Montreal Protocol, and develeopments in technological change such as in battery storage technologies. On the international stage The US has committed to cuts of 26 to 28 per cent below 2005 levels by 2025 and the European Union to a 40 per cent reduction on 1990 levels. Russia has a 25-30 per cent target by 2030 but based upon 1990 levels. Even Canada, seen as being very weak with their post 2020 targets, committed to 30 per cent reduction by 2030 on 2005 levels. Australia doesn’t even match the Canadian low targets. We are on par with Japan which has a 25 per cent target by 2030. As predicted by some commentators, the Government has chosen to move the baseline of our target from 2000 to 2005. The original baseline under the Kyoto Protocol was 1990. 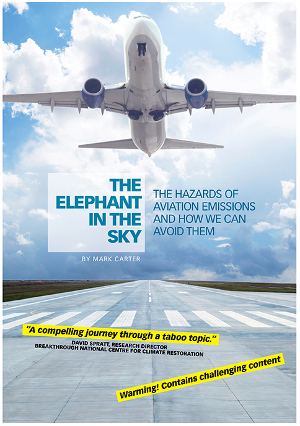 Moving the baseline is like fudging the accounting books to make a cut in emissions larger than it actually is. A 25 per cent cut on 2005 levels equates to an 18 per cent cut on 2000 levels, or 19 per cent cut on 1990 levels. Our commitment is not even equal to current US action and our per capita emissions would remain extremely high by international standards. 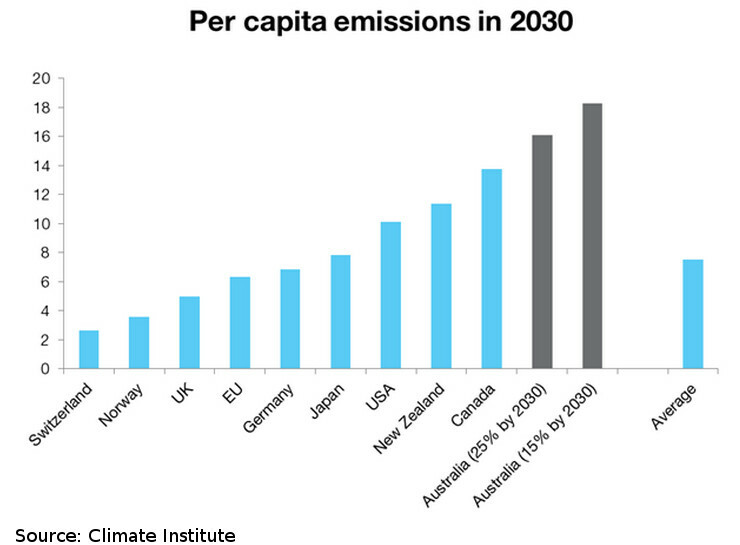 Australia’s 2010 per capita emissions were about 26 tonnes CO2e. With a 25 per cent cut on 2005 levels this would reduce to 16t/CO2e per person, still the worst among developed countries. Australia’s current commitment to the United Nations Framework Convention on Climate Change (UNFCCC) is to reduce emissions by 5 per cent by 2020, based on the level of emissions in 2000. This was part of a range committed to by Kevin Rudd at Copenhagen in 2009 of 5 per cent to 25 per cent. In March 2014 the Climate Change Authority assessment said comparative international conditions had been met to lift our 2020 target to 19 per cent on 2000 levels, but the Abbott government has refused to budge to lift Australia’s near term target. The Australian government has remained in denial in action on climate change, with Australia’s Foreign minister Julie Bishop shunned at UN climate summit in September 2014. In July the Marshall Islands submitted it’s climate targets to the United Nations and urged Australia to lead on climate action. They put Australia’s low targets to shame. Australia’s low targets came under questioning and veiled international criticism at the Bonn climate talks in June 2015, in the lead up to the Paris Climate Conference (COP21) at the end of this year. Opposition Spokesman on climate change, Labor MP Mark Butler said in a statement that it was committing Australia to one of the weakest emissions reduction targets in the developed world. “If his own Cabinet couldn’t trust Mr Abbott to take climate change seriously, how can Australians? Director of the Climate Change Research Centre at UNSW Professor Steven Sherwood said the target was about half what was really needed and would reinforce global attitudes that Australia is a climate leaner, not a lifter. Associate Professor Frank Jotzo, Director of the Centre for Climate Economics and Policy at the Crawford School of Public Policy, ANU highlighted that the 26 to 28 per cent target falls far short of the agrees 2 degree goal, and although other countries also fall short it is by a lesser amount than Australia. “Among the international community, the target is likely to be perceived as falling short in its ambition relative to Australia’s opportunities to cut emissions deeply. However this target means Australia is at least on the boat with international climate action, even if considered a laggard. Domestically it opens the door to stronger climate change action. A credible plan for domestic policy to achieve the target will be needed. 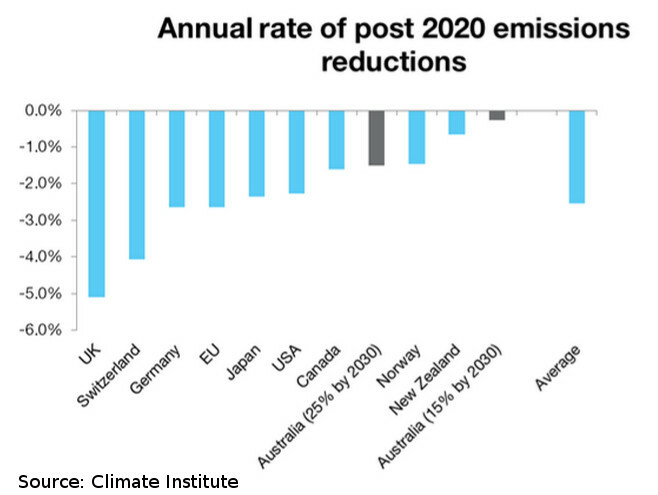 Australia’s target for reduction in absolute emissions is significantly weaker than that of the United States and the EU, weaker than Canada’s, and on par with Japan’s. The choice of 2005 makes Australia’s target look better than under other base years. 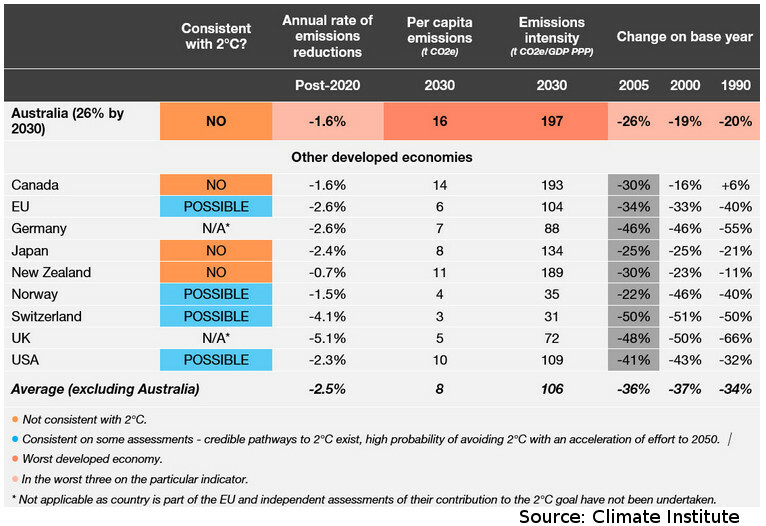 When comparing the targeted 2030 emissions level to emissions in the year 2000 or 2012, Australia’s target is much weaker than that of the comparator countries. 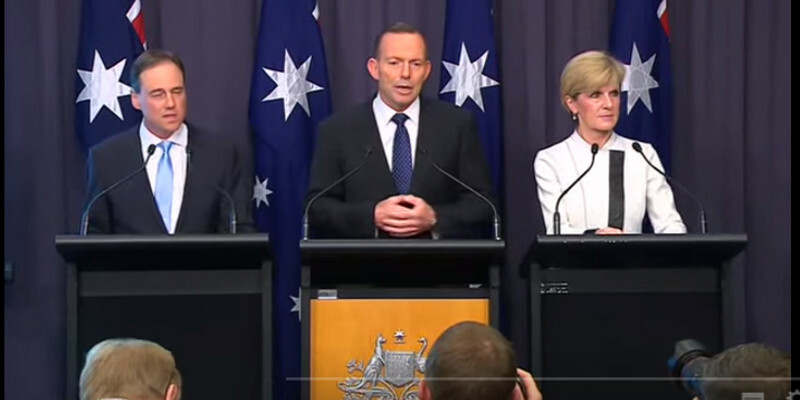 Tony Abbott stressed that climate action should not come at the expense of economic prosperity or damage the economy. Yet this assumption is deeply flawed as while some companies and sectors may see increased costs and need to change, others will grow as part of an economic transition. Professor Roger Jones from the Victoria Institute of Strategic Economic Studies (VISES), Victoria University, also levelled criticism of the lack of integration of policy instruments. The Government is refusing to use the advice of the Climate Change Authority, abolished the carbon price, wound back the Renewable Energy Target, sought to undermine renewable energy investment, attempted to stiffle the Clean Energy Finance Corporation through changing it’s mandate to return unrealistic returns and investments. “The government and the opposition have an opportunity to join mainstream Australian attitudes with climate commitments and policies which can limit carbon pollution, encourage renewable energy and clean up our energy system,” concluded Connor. This is in agreement with previous public opinion. A July 2015 Essential research poll found Renewables firmly favoured by Australian Public. The half a million sample size in the Votecompass survey prior to the 2013 election found that most people supported carbon pricing and favoured strong climate action. Opinion survey during the middle of 2014 revealed Australians wanted the Australian Government to provide leadership on climate action. Entry filed under: climate change info, news, Policy. Tags: climate targets, Julie Bishop, Tony Abbott.